Naturally, the fans were mobilized to piece together the potential meaning of this image, sometimes drawing such strange and unlikely conclusions that you had to wonder if the filmmaking brothers were just messing with our heads. 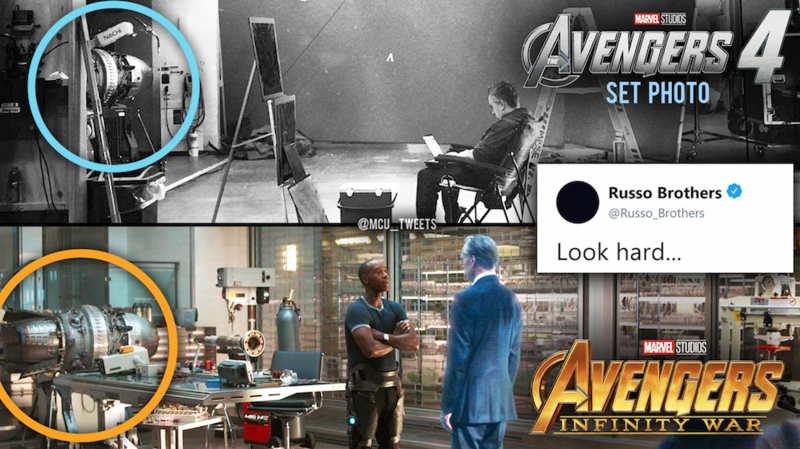 That being said, one Twitter user may actually be onto something when they observe how the partially obscured device to the far left of the photo bears a striking resemblance to a prop seen in the background of the recent Avengers: Infinity War. This mysterious machine is located in the headquarters of Earth’s Mightiest Heroes, and your guess is as good as ours on what part it could play in next year’s release. Lord knows, fans are certainly going to try figuring this one out, and while we seriously doubt that the Avengers casually have a time machine or a gateway into the quantum realm lying around, you can bet that the theorists will find some way of working the prop into some of the more popular pre-existing predictions. We’re still many months off from finding out what the Russos actually have in mind for Avengers 4, but we’ll likely receive a few answers in the upcoming Captain Marvel. Infinity War teased Carol Danvers as the last great hope for the Marvel Cinematic Universe, so it’s all but certain that she’ll have some important role to play in the final fight against Thanos, alongside the few established heroes who survived Infinity War. It all comes together in Avengers 4, which is set to bring Marvel’s Phase 3 to a close, while hopefully telling us what that big engine thing does, when it hits theaters on May 3rd, 2019.